Despite a 2013 state law aimed at boosting immunization rates, the rate for non-medical exemptions to mandatory kindergarten vaccinations hit a record high this school year, according to the Oregon Health Authority. The non-medical exemption rate rose to 7.5 percent this year, higher than the 7 percent rate during the 2013-2014 school year when the law was passed to address declining vaccination rates among the state's nearly 700,000 schoolchildren. Healthcare providers play a crucial role in educating parents about the need for vaccinations, said Stacy de Assis Matthews, immunization law coordinator for the health authority's Oregon Immunization Program. Yet education efforts face a daunting popular culture belief that immunizations can cause autism and other problems. The 2013 law — which required parents to jump through more hoops to obtain a non-medical exemption – initially decreased the exemption rate from 7 percent to 5.8 percent in 2015. But the following year, the rate began to climb again, first to 6.2 percent in 2016, then to 6.5 percent in 2017 and finally, to 7.5 percent this year. Non-medical exemption rates for students in grades K-12 this year ranged from a low of 1 percent in Morrow County to a high of 10 percent in Josephine County. 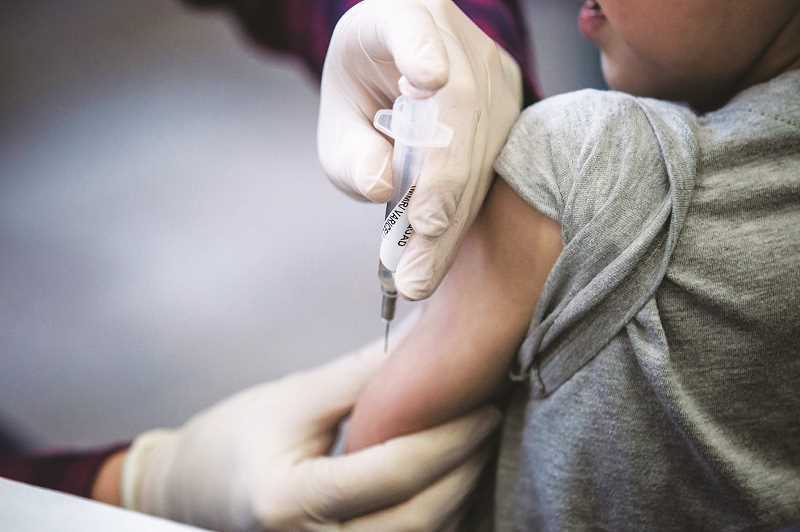 "While more non-medical exemptions mean fewer children are being immunized, the vast majority of Oregon parents and guardians still choose to fully immunize their children," de Assis Matthews said. "Most parents and guardians know that immunization is still the best way to protect children against vaccine-preventable diseases such as whooping cough and measles." But the decline in vaccinations has coincided with outbreaks of vaccine-preventable disease. More than a dozen students in Lane County, including two at the University of Oregon, contracted whooping cough earlier this spring, according to media reports. Oregon law requires parents who seek a non-medical exemption to receive education about the risks of foregoing immunization from one of two sources. They can opt to submit documentation that they have watched an educational video on the health authority's website or have consulted with a healthcare provider. About 95 percent of parents choose to provide documentation of watching the online video, de Assis Matthews said. "That is not to say parents aren't talking to health care providers," she said. "Anecdotally, we are hearing from healthcare providers that they do have discussions with parents and if parents are still wanting to claim an exemption, the providers ask them to watch the online video." Parents are not required to give a reason for their objection to immunizations. The anti-vaccination movement dates back to 1998 when a reputable medical journal, The Lancet, published a study by British physician Andrew Wakefield that claimed there might be a link between the measles, mumps and rubella vaccination and autism, though the study was subsequently and overwhelmingly debunked by the vast majority of researchers, according to a 2013 history by the Columbia Journalism Review. Rates of autism continue to rise every year. The most recent data from the Centers for Disease Control and Prevention showed the development disorder affects one out of every 59 children in a count of 11 communities across the United States. The scare over vaccinations started gain momentum in 1999 when the Federal Drug Administration found that there was no evidence that thimerosal in vaccines was harmful but as a precaution, recommended removing the ingredient from vaccines given to infants. The panic intensified in 2000 when former British Prime Minister Tony Blair and his wife declined to disclose whether their son, Leo, had been immunized, according to the Columbia Journalism Review. Years later, the couple said he had, in fact, been vaccinated on schedule, the CJR reported. Subsequent studies by the CDC have found no evidence to support a link between vaccines and autism. In 2015, Oregon Sen. Elizabeth Steiner Hayward (D-Beaverton) proposed a law to eliminate philosophical exemptions to mandatory vaccines, but she later withdrew the legislation after hearing opposition from both Democrats and Republicans.